I was a graphic artist for over 25 years. Having had a dollhouse as a child, I always wanted one as an adult. 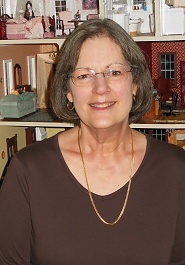 After raising two sons, I finally built my dollhouse and found one was not enough. Three dollhouses, the childhood one rehabbed for my sister and numerous roomboxes later, I'm still creating miniatures. I started doing needlepoint as a teenager, so it made sense to stitch petitpoint pieces for my miniatures. I was always looking for charts I wanted to stitch and finally started designing my own. I design patterns I want to stitch and I never sell a chart until I have stitched it. You won't find any computer-generated pictures of the designs here, It will always be a finished piece. I use silk threads with silk gauze, primarily on 48 count. All charts include the DMC equivalents provided with color and symbols. The designs can be stitched on higher or lower counts. The stitch count is included so it is easy to refigure the finished size. I prefer traditional designs but sometimes stretch my boundaries. The rug charts are offered as downloadable PDF files, or if you prefer, a packaged chart which will be mailed at additional cost. Pillows are offered as PDF chart only or kits. The kits come complete with silk gauze mounted in a frame, silk threads, chart, instructions, needle, ultrasuede backing and cord for trim. The only thing not included is the stuffing. 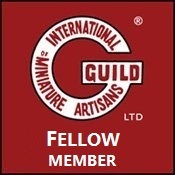 I became an Artisan member of the International Guild of Miniature Artisans (IGMA) in 2013. In 2016, I became a Fellow Member of IGMA.